Puri for panipuri 30 no. Soak the kala chana for 7-8 hours / overnight in water. Boil chana and potatoes with salt and water in a pressure cooker for 3-4 whistles over medium flame / until cooked. Take mashed potato, kala chana, red chili powder, roasted cumin powder, chaat masala powder, coriander leaves and salt in a bowl. Mix them together with a spoon. Now the time starts to assemble panipuri. Take each puri and gently make a large hole on its top-middle side (thin side) by poking it with a spoon / finger for stuffing. Stuff it with masala. Sprinkle onion and sev followed by tamarind chutney over it. Take pani for panipuri in a medium bowl. 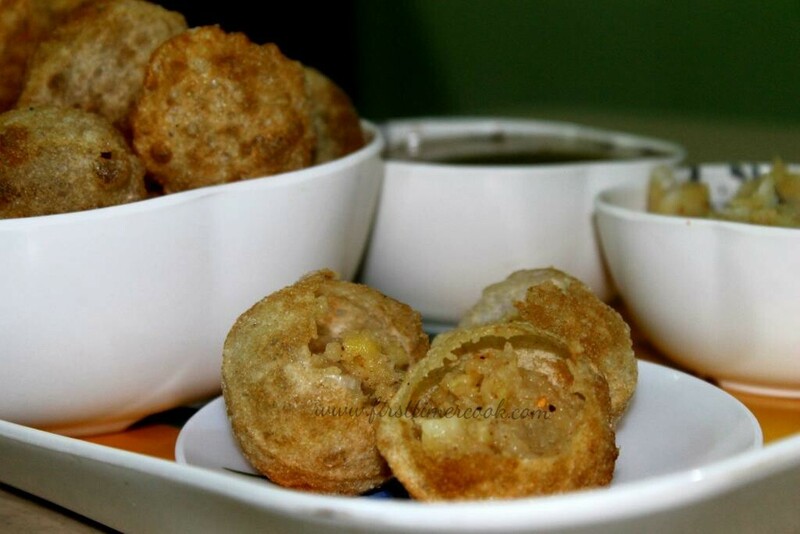 Dip each puri in the pani and pop in mouth immediately ! The stuffing can be as desire. Several items that can be stuffed in the puri are – boiled white channa, boiled green peas, boiled green gram (moong) sprouts, boiled mixed sprouts etc.